Camp on a solitary oasis, experience the dark starry nights and dance to musicians playing haunting music. 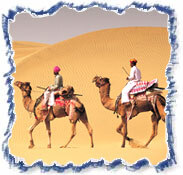 Camel safaris are ideal ways to spend time exploring rustic Rajasthan. 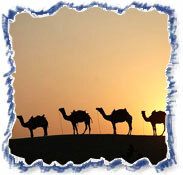 A camel safari move through the golden sands, of the savage Thar Desert passing through remote villages. There can be no, better way of experiencing life in the desert than through a journey into its hinterland on camel back. The halts are arranged outside the villages enabling you to observe village life from closer quarters. Watch the orange sands being kicked up in little puffs as flocks of cattle and sheep come back from grazing, or watch children scramble to a school where a teacher may hold a collective class for children of different ages. Fly from your country to New Delhi, you will be greeted & assisted upon arrival. Transfer to Hotel for overnight stay. Breakfast at Hotel and then leave for full day sightseeing of Old and New Delhi visiting Jama Masjid, enjoy rickshaw ride in narrow alleys of old Delhi through, Kinari Bazaar and 400 years old Chandni Chowk, Red Fort, Crematory of Mahatma Gandhi, Birla Temple, Parliament House, Presidential House, India Gate, Government buildings & Qutab Minar. Return Hotel for overnight stay. Morning leave for Mandawa through the villages of Rajasthan. Arrive & check in at Hotel Castle Mandawa, afternoon visit the 150 to 200 years old painted havelies (big houses) by the natural colors in the streets of the village. You can also watch the daily village life while watching the (havelies). Overnight at Hotel. Morning leave for Bikaner founded by Rao Bikaji Ji in 1488 A.D. Arrive & check in at the Hotel. Afternoon visit Junagarh Fort founded in year 1593 by Raja Rai Singh who was general in the, army of mighty Mughal emperor Akbar and rest of the Fort was improved by the successors. Afterwards visit Asia's largest Camel Breeding Research Farm and local busy markets. Overnight at Hotel. Drive to Jaisalmer (330 kms / 7 hrs). Check into hotel and overnight in Hotel. Full day sightseeing tour of Jaisalmer, which includes visit the 12-15th century Jain Temples, Folk Museum, Gadi-Sar Tank & the colourfully painted homes known as havelies. Evening transfer to camp on San Dumes - Camel ride. Morning Camel Ride. Afternoon drive to Pokhran (110 Kms / 3 hrs). Overnight in Hotel. Morning visit Pokhra Museum, Pokhran Palace, Ramdeo Temple, Chhatris etc. Afternoon drive to Jodhpur (172 kms / 4 hrs) drive. 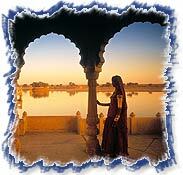 Full day City tour of Jodhpur visiting Mehrangarh Fort, Mahamandir Temple and the Kailana Lake. Evening transfer to Railway Station to connect train #2462 Mandor Express dep. 19:30 Hrs. for Delhi. Overnight in Train. Arrive Delhi at 05:55 hrs. Day free for own activities or shopping. Overnight in Hotel. Transfer to international airport to connect flight back to home (hotel checkout 12:00 hrs).